I finished the sweater, and still can't find the camera. Trust me, he loved it. He put it on, and it fit great. It was slightly big, so he can wear a shirt under it, and he may be able to wear it next year as well. 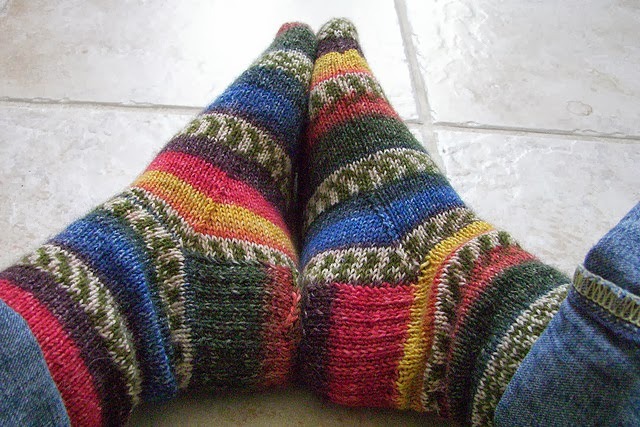 I also started the French Press Slippers, and they are all knitted. I had markers in it, then removed them, then put them back. After watching the tutorial for seaming, I think I may iron the pieces slightly so they don't curl as much. It's a little hard to see the edges, as they do curl a lot. I'm sure though that I'll make this pattern again - it's easy and fun. I still have one more item to knit for this month, in order to keep up with my goals. So, I'm really not doing too bad. However, I'm feeling a little under the weather. I think the cold that's been going around my office has finally struck me. I'm fighting it for all I'm worth, but if not, it could definitely slow me down. Sleep, fluids, and soup will be my mantra. I'd really like a pair of socks, though.